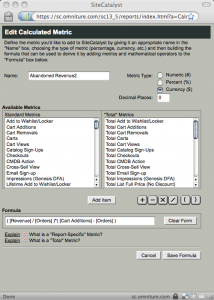 To view this data in Omniture, create a calculated metric by clicking “Manage Calculated Metrics…”, and then clicking “Define a New Metric.” Then paste the above formula in the text box that appears. 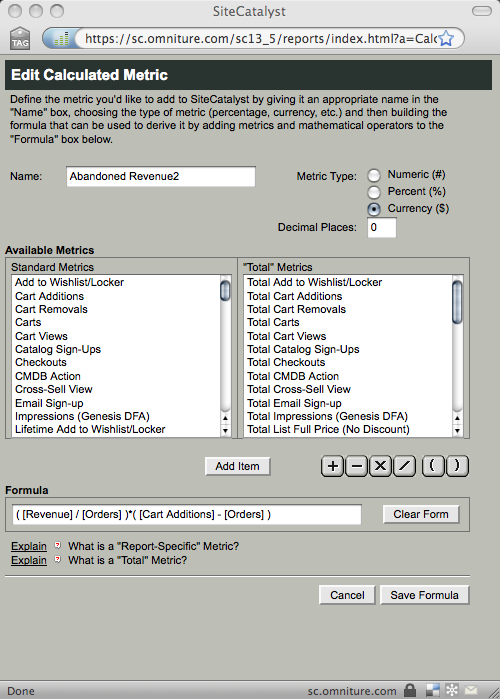 When you save the new metric, you’ll be able to select it and view the results instantly, which is a cool feature. If you’re a Google Analytics user, calculate abandoned revenue using your AOV and the data from your Abandoned Funnels report in the goals section. When you look at these numbers or – more importantly – make any decisions based off of them, it’s important to remember a few things. This metric is based on a very important average; average order value. You’ll want to capture ALL abandoned revenue, but it’s not realistic. If you don’t set a realistic target, you will stumble. Startled by your abandoned revenue? Let me add some perspective. Abandoned revenue is often 5-10x (or more) daily revenue. I have multiple clients with millions of dollars of abandoned revenue per day. Don’t freak out… and don’t go tell a VP (yet). One of my points above is that it is not realistic to capture all of your site’s abandoned revenue. I am all about expectations. I want to be honest and the truth is that it’s impossible to eliminate abandoned revenue and abandoned carts. Of course, we would not have jobs if it was not possible to capture some of that revenue.